Car Pretty LLC - 8/16" - One Color, Two Line, Opaque and Metallic Stripe. 8/16" - One Color, Two Line, Opaque and Metallic Stripe. 8/16" pinstripe is a good size stripe for an 8/16" truck pinstripe. 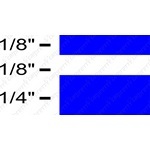 This 8/16" one color truck stripe consists of 1/8" stripe, 1/8" void, 1/4" stripe. Turn the roll around if you want the 1/4" as your top line.